Find a convenient solution for your furry friend with one of these top-rated cat doors. "Takes the number one spot for its simplicity, price tag, and reviews." "Installation is easy for pet parents." "The freedom to come and go as she pleases, while avoiding pests." "It’ll ensure your cat safe entry and exit while preventing strays." "Real-life customers love this cat door for its durability and function." "Designed to fit all standard doors from 1.25” to 1.75” thick." "Has a grooming brush to dust dirt and litter off your cat as he passes through." This cat door from Ideal Pet Products takes the number one spot for its simplicity, locking mechanisms, price tag and 500+ positive customer reviews. Although it’s a more basic model, this cat door can be used on both interior and exterior doors, and has a four-way locking mechanism: in only, out only, open or locked closed. It also has a magnetic, self-closing flap to keep unwanted pests (including stray cats!) out of your home. Made with super durable Lexan polycarbonate, this cat door will hold up against everyday use and harsher weather conditions. Plus, it’s easy to install—the frame mounts to any standard interior or exterior door with screws. This cat door’s flap is 6.25” by 6.25” and is ideal for cats 12 pounds and under. Some reviewers, however, share that their larger cats are able to use the door easily. If you have any issues with your purchase, the manufacturer offers a limited lifetime warranty; contact Ideal Pet Products for more specific details. If you’re on a stricter budget—or just want a no-frills cat door to install—check out this option from MOOST. Installation is easy for pet parents: It can be installed on any interior or exterior door, and comes with detailed instructions, a wood cutting template and all of the hardware necessary for installation. Meanwhile, its high-impact plastic frame and hard flap makes it easy for pets to go indoors and outdoors. Keep pests or other animals out of your home by engaging the four-way locking mechanism; you can choose to lock this cat door as in-only, out-only, both in-and-out or locked closed to suit your cat’s needs. The flap opening measures 7.5” wide by 7.9” high, so it can work well for cats of all sizes and small dogs that weigh 15 pounds or less. This cat door comes with a lifetime warranty, so if you’re unhappy with your purchase, contact the manufacturer for a resolution. 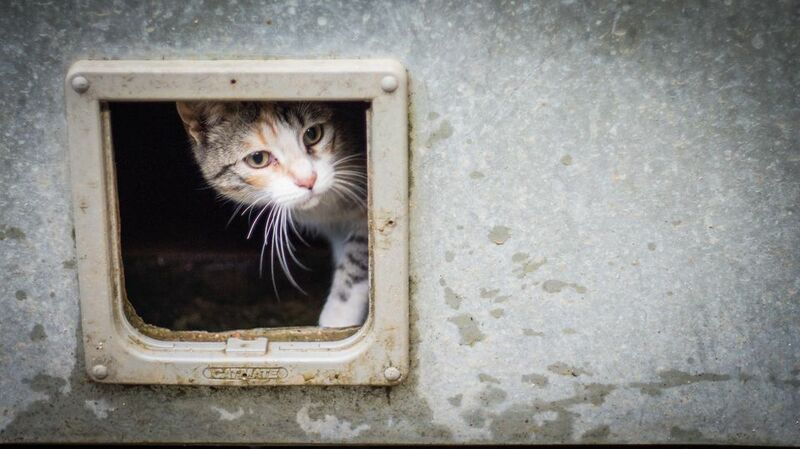 If you install a cat door, strays can be an issue; using a magnetic cat door, however, can prevent unwanted guests from entering your house. Cat Mate’s Electromagnetic Cat Flap sounds complex, but it’s actually simple to use: Your cat wears a small magnet on her collar, which doubles as an identification tag. A super sensitive circuit in the cat flap allows instant access when exposed to the magnet on her collar. Its four-way locking system allows any animal to exit, but requires the magnet to re-enter. Give your cat the freedom to come and go as she pleases, while avoiding pests or strays in your home. The manufacturer has some recommendations for using this product: First, the magnet should be attached directly to your cat’s collar with the paw print symbol facing forward. Then, ensure the four-way lock is fully seated in the correct position for use. Looking for a more high-tech option? Check out SureFlap’s MicroChip Cat Flap. Although it’s the most expensive cat door on our list, it’ll ensure your cat safe entry and exit while preventing pests or strays from entering your home. Rather than attaching a magnet or other access tool to your cat’s collar, this door works with your cat’s existing microchip. Here’s how it works: First, press the “program” button on the top of the door and push your cat through the tunnel. The door will read your cat’s existing microchip and download the information. Next time your cat tries to pass through the door, it’ll allow access based on the recorded microchip data. It’s compatible with 9-, 10- and 15-digit microchips and can remember up to 32(!) different cats. This cat door measures 8.2” by 8.2”, so it’ll work for small to large cats, and it can be mounted on interior or exterior doors, windows and walls with the correct mounting accessories. Specially developed for large cats or small dogs, Cat Mate’s Large Cat Door measures a whopping 8.25” by 9”. It’s ideal for any sized cat and small dogs with a shoulder height of 13” or less. This cat door can be installed on any interior or exterior door, panel or wall with the simple, do-it-yourself instructions and template provided. It’s outfitted with a rain-proof external frame seal, as well as a weather-proof seal with magnetic closure to keep the elements out of your house. With 400 reviews, it’s clear that real-life customers love this cat door. They tout it for its easy installation, durability and function. But if you’re unhappy with your purchase, the manufacturer offers a three-year warranty. Not only is Kitty Pass’s Interior Cat Door cute (look at the little ears! ), but it’s the easiest way to let your cat access closed interior doors, too. If you want to hide your cat’s litter box or food, or are tired of listening to her scratch your bedroom door at night, consider installing this pick. The Kitty Pass is designed to fit all standard doors from 1.25” to 1.75” thick and doesn’t require unsightly screws or hardware to install. Although this cat door is finished in semi-gloss white, you can repaint it to better fit your home’s color palette. The tunnel is 7.5” wide and 6.5” tall, so it can be used by most cats, but the manufacturer recommends it for cats weighing 20 pounds or less. Plus, the opening is made with super smooth plastic, so your cat’s fur or tail won’t snag. CatHole’s Original Interior Pet Door can also be used to hide a litter box or cat food behind interior doors or walls, but comes with an added feature: It has a removable grooming brush to dust dirt and litter off your cat as he passes through the tunnel. That means no more loose litter tracked around your house. Made of Baltic Birch wood (so you can paint it to match your home’s décor) this interior cat door is super easy to install with the included instructions and wood cutting template. This cat door is 8.5” wide by 8.5” tall, and is recommended for cats weighing 20 pounds or less. Heads up: Some customers said their 20 pounds cats struggled to get through this door, so it may be best for slightly smaller cats.